The process of sterilizing materials used in carton packaging has long been limited in efficiency by the use of hydrogen peroxide. However, a new filling machine that leverages electron beam technology may change that. Last month, a new filling machine was brought to market that uses electron beams instead of hydrogen peroxide to sterilize materials used to create carton packaging. The new technology is expected to offer a variety of benefits to manufacturers, including the ability to run up to 40,000 portion packages per hour. Compared to other options for material sterilization, this machine incurs lower operational costs, improves environmental performance, and allows for a greater range of production flexibility. The filling machine’s sterilization works by focusing a controlled beam of electrons onto the surface of the packaging materials as it is transported through the filling machine. Any bacteria or microorganisms that are present on the material are eliminated. Although electron beams are already used in a variety of food industry processes, this innovations is the first technology to make use of the beams in a carton filling application. The new machine is expected to provide users with greatly improved levels of efficiency and effectiveness while decreasing costs and environmental impact. By using an electron beam for sterilization instead of a hydrogen peroxide process, the major hurdle in achieving greater carton packaging speeds is removed. This allows the machine to reach an operational production level of 11 units per second. This increase in capacity translates to an operational cost savings of up to 20 percent. Additionally, the removal of hydrogen peroxide in packaging material sterilization greatly enhances environmental performance by making water recycling more feasible, noticeably reducing energy inputs, and decreasing waste. 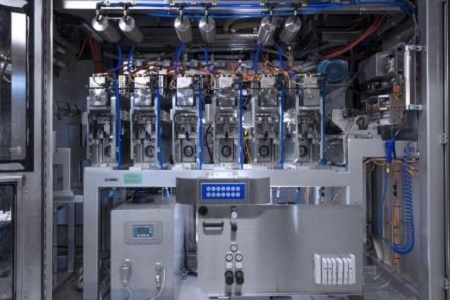 The modular design of the machine allows food and beverage manufacturers a higher degree of flexibility than traditional sterilization options, meaning they can easily use one machine for a variety of product applications. For example, users can readily switch between pasteurized and extended shelf-life products.